North Dakota Power of Attorney Forms can be used to accomplish a variety of appointments as a versatile set of documents. Each form has been developed to address a different scenario and provide a legal method for one person to appoint another to act on his or her behalf. It is also very important in each case that the representative being appointed is reliable, trustworthy and available. This representative, or agent, will have the power to make binding decisions on behalf of the person granting the power, or principal. Durable Power of Attorney – This version grants power over property and assets of the person granting the power. Because it is “durable” it is meant to continue to be in effect despite mental or physical impairment that prevents the principal from being able to act for him or herself. Signing Requirements: None stated in ND Century Code; however, notarization is recommended. General Power of Attorney – This version also grants general power over property and assets of the principal, however, instead of continuing to be in effect like the “durable” form, it self-terminates upon the incapacity of the principal. Health Care Power of Attorney Directive – Used exclusively for health care decision making and only when the principal can’t make his or her own decisions. Signing Requirements (§ 23-06.5-05): Notary public OR two (2) witnesses. Limited Power of Attorney – This version is for use when there is a specific event or time period for which you are seeking short-term representation. 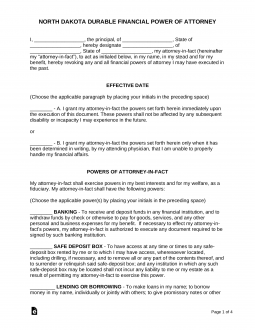 Minor Power of Attorney – This form is limited to decision making involving the principal’s minor children. It is generally used when parents are temporarily unavailable and have to leave their children in the care of a loved one. Real Estate Power of Attorney – Used to elect someone to handle all aspects of real property to the benefit of the owner in relation to its sale, purchase of another property, or management. Revocation of Power of Attorney – This is used when an individual wants to cancel or terminate an existing POA. Tax Power of Attorney (Form 500) – This form is used when a person wishes to have a representative handle any tax issues with the Office of the Tax Commissioner. Vehicle Power of Attorney (Form MVD-11020) – This form is used when a person wishes to have an agent or designee handle motor vehicle affairs.